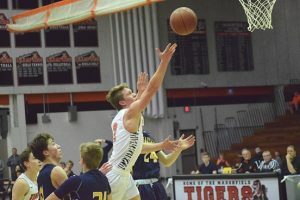 MARSHFIELD – The Marshfield boys basketball team overtook sole possession of first place in the Wisconsin Valley Conference with a 60-42 victory over Wausau West on Friday at Marshfield High School. The Tigers, who won their ninth-straight game, are now 12-4 overall and 8-2 in the Wisconsin Valley Conference, pulling one-half game ahead of Merrill, which had a conference bye on Friday. Stevens Point beat Wausau West and pulls into a tie with Merrill at 7-2 in the Valley. Marshfield made six 3-pointers in the opening 10 minutes of the game to open up a 24-6 lead and the Tigers led by double digits the remainder of the game. Brant Bohman had four 3-pointers in the first half and scored 21 points to lead the Tigers. A 9-0 run pushed Marshfield’s lead to 33-12 at the 4:18 mark of the first half and the Tigers took a 37-20 lead into halftime. While Marshfield didn’t play its sharpest game of the season, turning the ball over 12 times and fighting through foul trouble from a number of starters, the Tigers’ defensive effort was smothering. Marshfield forced 18 turnovers, which resulted in 12 more shot attempts and a number of easy transition baskets. A rebound and basket from Joey Goettl, a steal and layup from Cody Korth, and a 3-pointer by Sam Hinson gave Marshfield its biggest lead at 51-28 with 10 minutes to go. West closed to within 14 at one point, but the Tigers were in control throughout the final minutes. Peter Fuchs scored 16 points off the bench to lead West (2-15, 0-9 Wisconsin Valley Conference). Marshfield jumps back into action Saturday with a conference game at D.C. Everest starting at 3:30 p.m.
WAUSAU WEST (42): Antonio Williams 0-2 2-2 2, Mitchell Zahurones 2-3 2-2 6, Tim Deloye 1-3 0-1 2, Ryan Hartman 3-7 2-3 9, Peter Fuchs 6-9 3-4 16, Logan White 3-6 1-4 7, Nick Raasch 0-0 0-0 0, Max Helke 0-0 0-0 0, Garrett Richardt 0-0 0-0 0. FG: 15-30. FT: 10-16. 3-pointers: 2-6 (Hartman 1-2, Fuchs 1-3, White 0-1). Rebounds: 16 (Fuchs 5). Turnovers: 18. Fouls: 15. Fouled out: none. Record: 2-15, 0-9 Wisconsin Valley Conference. MARSHFIELD (60): Isaac Meverden 1-3 0-0 2, Brant Bohman 7-10 3-4 21, Tommy Olson 4-6 1-2 9, Cody Korth 1-2 0-0 2, Anthony Posteluk 2-3 1-2 6, Preston Wagner 3-7 0-0 8, Sam Hinson 2-3 0-0 6, Kyle Tremelling 0-0 0-0 0, Joey Goettl 1-5 0-1 0-0 2, Addison Hill 2-3 0-0 4, Bennett Koehn 0-0 0-0 0. FG: 23-42. FT: 5-9. 3-pointers: 9-20 (Bohman 4-7, Hinson 2-3, Wagner 2-4, Posteluk 1-2, Meverden 0-1, Korth 0-1, Goettl 0-2). Rebounds: 21 (Hill 4). Turnovers: 12. Fouls: 17. Fouled out: Meverden. Record: 12-4, 8-2 Wisconsin Valley Conference.